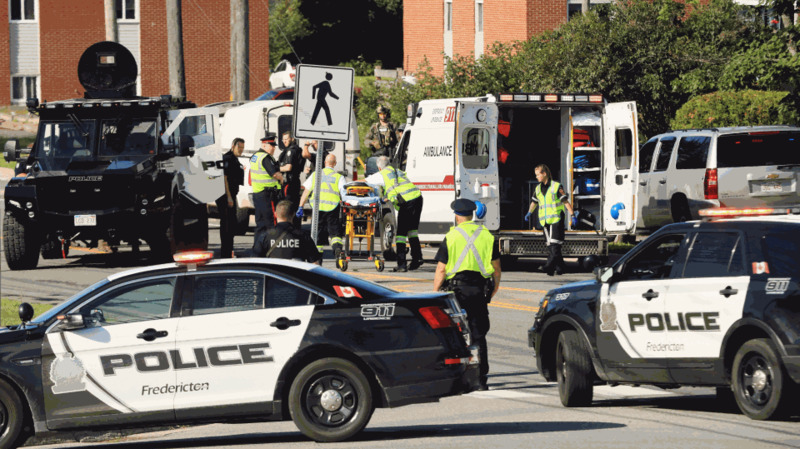 FREDERICTON -- Newly released documents reveal how last week's deadly attack unfolded in Fredericton, including a brief account from the police officer who shot the alleged gunman in the abdomen. The province's Court of Queen's Bench had issued the ban on Monday -- hours after media reported on their content -- imposing an information blackout on the sequence of events that claimed the lives of Bobbie Lee Wright, Donnie Robichaud and police constables Robb Costello and Sara Burns. The Crown information sheet says at around 7:20 a.m. last Friday, a woman called 911 to report shots fired at 237 Brookside Drive. It says the woman said someone was on the ground and she wasn't sure if they were alive. "Sgt. Forward then heard a couple more gunshots so he proceeded into 237 Brookside Drive in back of building C," the document states. "Once there, he noticed Constables Costello and Burns laying on the ground not moving. He also noticed another male on the ground and not moving, beside Const. Costello." "Const. 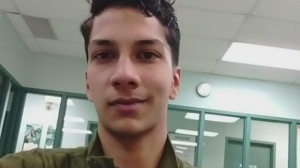 Arbeau believed he had hit the shooter in the torso," the document says. "A little while later members of the (Fredericton Police Force Emergency Response Team) entered the apartment and took the lone occupant and shooter into custody. The suspect had been shot in the abdomen." Police found "items believed to be firearm(s) and ammunition" inside the apartment. Police have said previously that Wright and Robichaud, who had just begun a romantic relationship, were shot first in the parking lot outside Robichaud's apartment building, and the two officers were shot when they responded. Police say in the document that Wright's body was found in the passenger side of a vehicle -- which was registered to Wright -- and all four victims were found in and around the vehicle. The vehicle's windshield had been blown out. Several media organizations had challenged the publication ban in the province's Court of Queen's Bench, and arguments were made earlier this week. Prosecutor Cameron Gunn had told the court that the Crown was prepared to withdraw a bid for a blanket publication ban, but an amended order seeking a more "narrow ban" had been filed instead. That ban would have unsealed the documents but continue to block the publication of names of individuals who have not spoken with media yet. In handing down her decision Friday, Justice Judy Clendening said "the evidence falls short of establishing that a ban should be granted, even in the narrow situation of the protection of the privacy of the individuals." "I do not find that the salutary effects of granting the publication ban strongly outweigh the deleterious impacts," the judge said in an eight-page decision delivered orally. On Friday, Coles called the judge's decision sound, saying that there must be compelling evidence to justify overturning the presumption of an open court and a transparent judicial process. "This terrible tragedy I suggest leaves a community hungry for as many details as they can be given to try to understand what happened," said Coles, who represented a consortium of media outlets including CTV, CBC, Global, Brunswick News, Postmedia and The Globe and Mail. "So long as the details that are released won't interfere or hinder the police investigation or the prosecution in any way, then providing that information in my opinion just better informs the citizens of Fredericton and indeed all Canadians in this national interest story." A public visitation was held Wednesday evening for Wright at a funeral home near Woodstock, N.B., although her obituary said there would be no funeral service by request and her interment would be held at a later date.